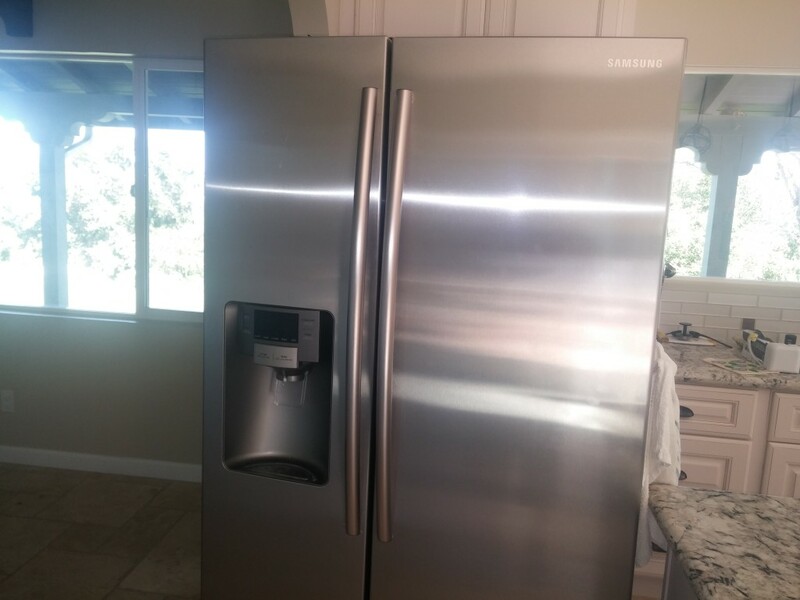 We repair all Samsung appliances, included Samsung Side-By-Side Refrigerators with Built-In Ice Makers. 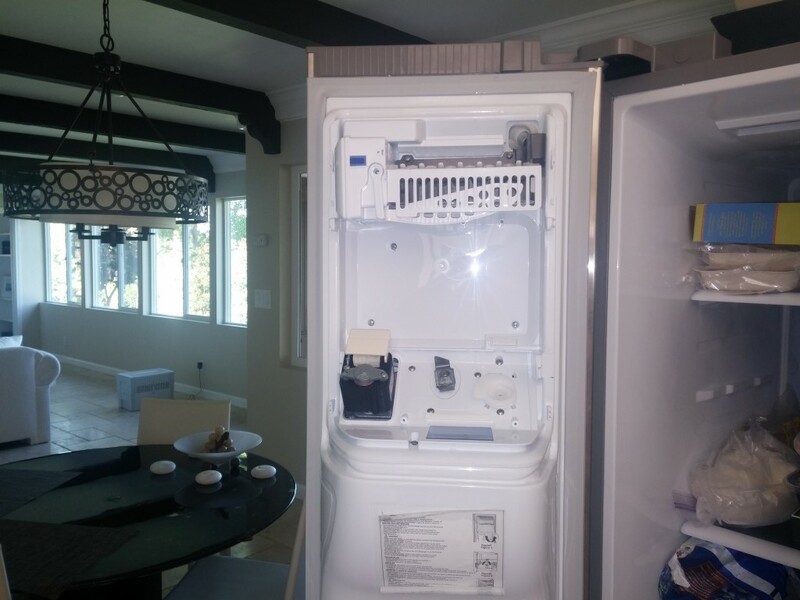 For this Samsung Ice Maker Repair, many different parts of the ice maker must be disassembled before the ice maker can be removed from the refrigerator’s side door. Once the ice maker is removed a new replacement can be installed in its place. Give us a call at 619-327-9501 to schedule an appointment for your appliance repair. Samsung Side-By-Side Refrigerator with an ice maker built-in to the door. 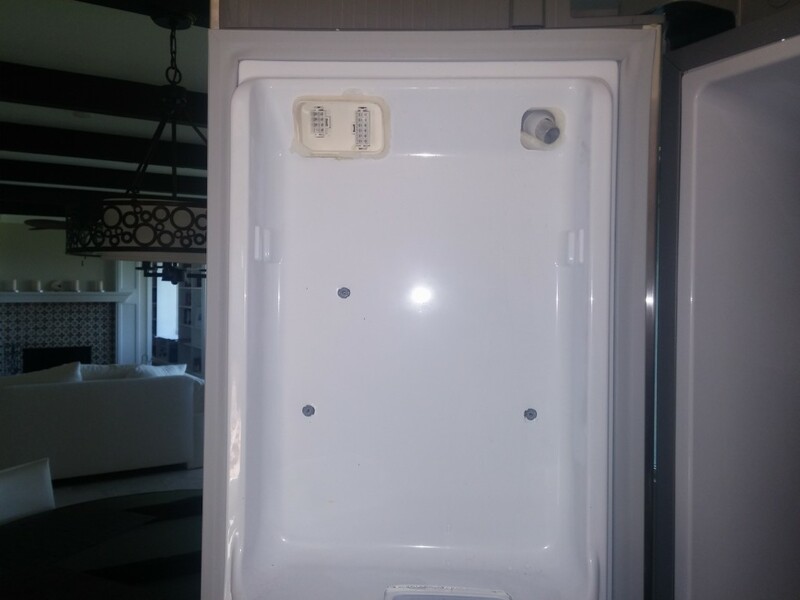 We begin this Samsung Ice Maker repair by removing any plastic panels that are covering the ice maker. 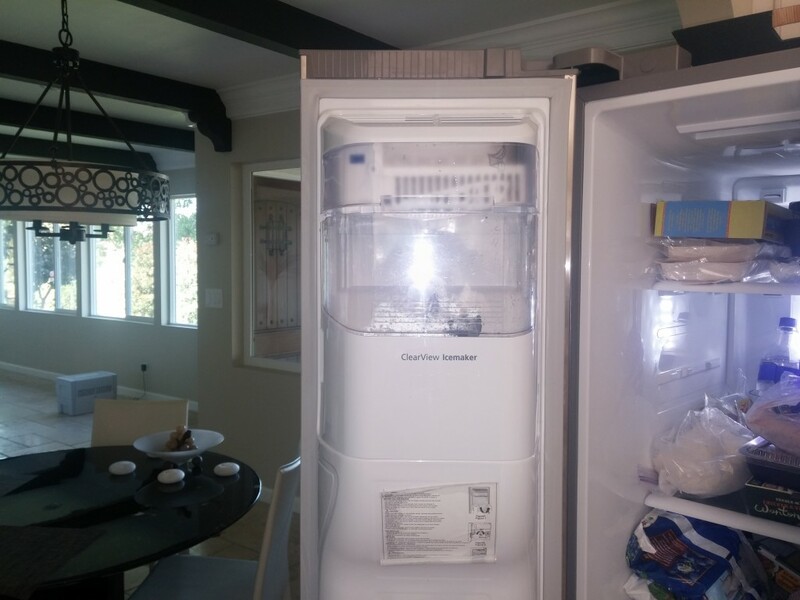 The ice maker itself is usually somehow connected to the water line and the water dispenser in the refrigerator’s door. We can then remove the attaching ice maker screws and remove the ice maker. To begin the Samsung ice maker repair we must remove the non-working ice maker from the refrigerator’s door. Starting the process of removing the ice-maker from the door. Continuing the disassembly of the ice-maker. 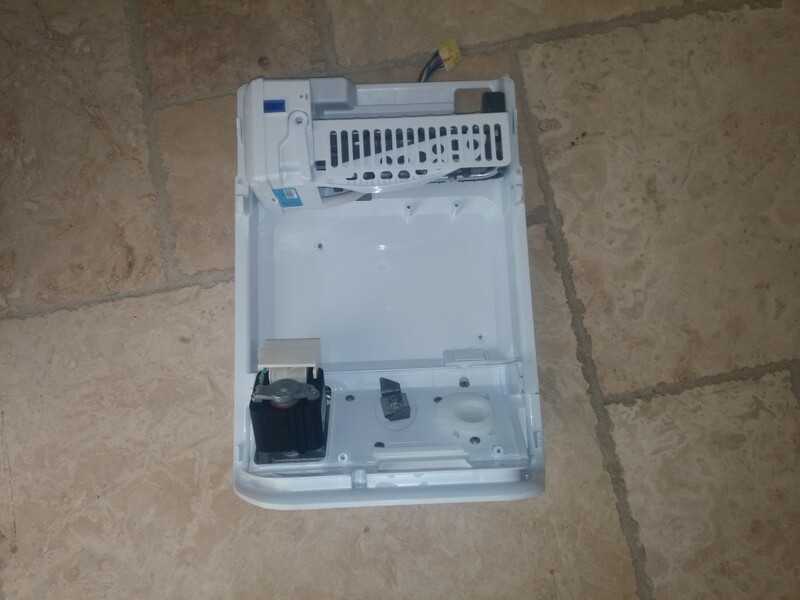 A view inside of the Samsung Refrigerator’s Door with the broken Ice Maker Removed. 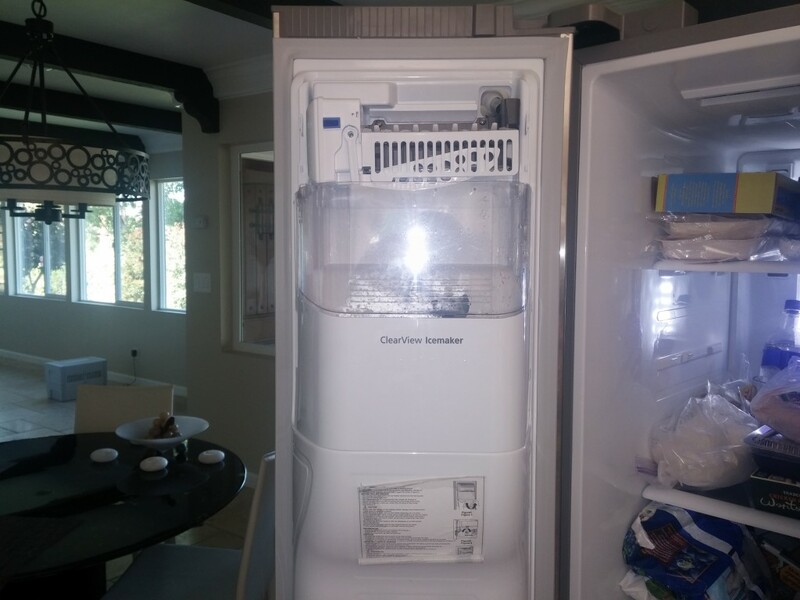 Once the ice maker has been removed from the refrigerator, the replacement ice maker unit can be installed. This process is nearly the same for all door-mounted refrigerator ice makers. 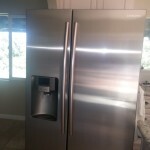 This Samsung Ice Maker Repair is just one of many repairs we have completed througout San Diego, Chula Vista, and more. Scroll down to for our phone number or, you can also check out our Kitchen Aid Refrigerator Ice Maker Repair, or one of our LG Ice Maker Repairs. The non-working ice maker removed from the fridge. Since we’re talking about ice makers, lets show a quick video about How a Refrigerator’s Ice Maker Works. Thank you for visiting! Please give us a call at (619) 327-9501 if you would like to schedule our appliance repair services. You can also schedule an appointment online, or contact us with any questions.